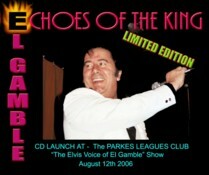 Australia's performer with the "Elvis" voice returns to the Elvis scene after an absence of 28 years! Introductory remarks: The name El Gamble will strike a resonant chord with long time rock and roll and Elvis fans in Australia. 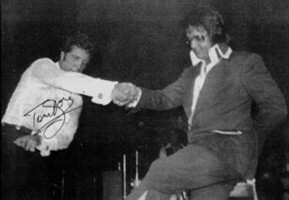 El was the original Elvis tribute artist back in 1977 and after Elvis' death he went on to perform nearly 300 "sold out" shows in the ensuing year. At a time when a young Roy Hawkins was also starting out and Eddie Youngblood was soon to arrive, what set El apart was his incredible voice, a voice remarkably similar to Elvis'. Despite his great success, after 12 months of doing his Elvis show, The Life and Times of Elvis Presley, El was physically and mentally exhausted. Needing a change El Gamble entered the show band/rock and roll arena where he enjoyed a very successful stint fronting The Cadillacs in Queensland. Twenty-eight years after his last Elvis show, and now afflicted with a rare medical condition where he has no feeling in his legs, El is back on the Elvis scene to perform. 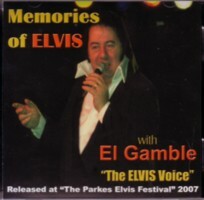 Before his comeback performance in Australia’s home of Elvis, Parkes, NSW, Australia’s original Elvis tribute artist, El Gamble, sat down for a long chat with EIN’s Nigel Patterson. In this fascinating, self-effacing, and at times very amusing interview, El tells EIN what he has been doing for the past 28 years, his inspirational personal battle to regain his ability to walk, and his anxious return to the Elvis scene. and you won't believe how long it takes him to record an album! EIN: El, welcome back. It sure has been a long time since we've been treated to your Elvis show. EG: You are not wrong. It has been a very long time, 28 years to be exact. 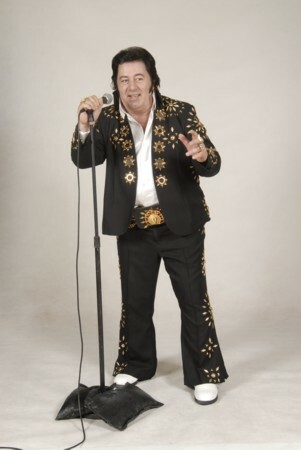 EIN: How daunting was it coming out of “Elvis” retirement to perform in Parkes tonight? EG: It was hard, real hard. I remember saying to Ian, my manager, “You’re crazy”. I’ve got no legs, I can’t compete with these young guys doing it. He said “No, you’ve got the voice and the public will appreciate that”. Until Ian’s suggestion and pushing, I really had no intentions of doing another Elvis show. Of course the way I do it now, it’s not an Elvis show in the sense of me dressed in a jumpsuit and gyrating. It’s a tribute to his music and I don’t dress in a jumpsuit. EIN: So what have you been doing since you left the Elvis scene in 1978? EG: For nearly 10 years I was performing in normal bands and over the last eight years I’ve been doing duo and solo work. Basically, I’ve performed in the eastern states, NSW, Victoria and Queensland . When I was doing the Elvis show it was a different thing. I toured all around the country. EIN: You are renowned as Australia’s original and best Elvis tribute artist, whose Elvis tribute show was a huge success after Elvis died. Please tell us about the history to that time in your life. EG: It all started when we were rehearsing a show when Elvis was alive. My then manager, Phil Gilotta, rang me and said we’ve got the show on next week but have you heard the news today. That was on a Wednesday at 8.30 in the morning. I’ll never forget it as he never rings me that early. Initially I didn’t believe him but he said turn on any radio station which I did and of course that was all they were talking about. Anyway we did the show as people had already bought tickets to it. I was concerned it might be seen as being in bad taste to do a show so close after Elvis’ death but we were committed to it. As a result of that show I ended up doing 286 shows in 12 months and 14 days. At that time I never appeared on stage without a jumpsuit. However after a year of doing so many shows I was exhausted needed a change. I don’t want people to take this the wrong way but I had done so much Elvis I just wanted to sing a Beatles song or a song by other artists. I’d just had enough and needed to recharge my batteries doing something different. EIN: The Life and Times of Elvis Presley was an outstanding success. EG: Mate it was incredible. The fan reaction was unbelievable. Everywhere we went it was the same. They just couldn't get enough of it after Elvis died. I guess they needed tribute artists like me to give them back some of what they lost when Elvis died. It was a big show. There were 16 other performers on stage with me, musicians, back up singers etc. And none of us could believe how we sold out show after show after show. I still look back at that time and can't believe how good it was. You know our first Elvis show was held at the Council Club hotel (now called Cramers) in Preston in Melbourne, to a record breaking attendance which still stands today. I'm real proud of that. 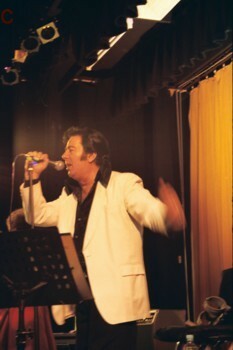 EIN: Were there any other Elvis tribute artists in Australia when you started your show? EG: I've been led to believe I was the first. And I certainly was the first in a jumpsuit I'm pretty sure Roy Hawkins started after me and it was a few years before Eddie Youngblood came on the scene. And of course Roy did the younger Elvis, he didn't wear a jumpsuit. You know it's funny, I started out with one jumpsuit and after 12 months I had four, but mate I can tell you, after that year of constant touring, I didn't want to see another jumpsuit again for a long time. I mean on one level it was fantastic but by the end it was just such a taxing time physically and emotionally. EIN: Let's go back to the start. Do you come from a musical family? EG: Yes. My mother is from Greek background and my father is Spanish. All of father's brothers were in bands. My uncle had a Latin American band. As an 8 year old I began mucking around on the drums, thinking I was learning to be a good drummer. You know what it's like when you're a kid. My uncle was a singer and he used to say to me, "If you're going to sing, make sure your voice is like a piece of elastic, that you can do anything you want with it. Don't stay in one style." Those words stuck in my head. EIN: What is the origin of your name? EG: My real name is Emmanuel La Gamble. I used to get called Manny or El for short. My surname translates as "The Gambler". 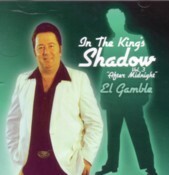 One time I entered a talent quest at the Peppermint Lounge and unknown to me my cousin told the promoters my name was "El Gamble". Up until that time I had just been using my real name. 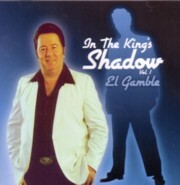 Anyway I was sitting there watching the show when they called for El Gamble to take the stage. No-one got up and I said to my cousin , he must have left already. My cousin just smiled and said "No, it's you, I gave them your new name!" And ever since I've been known as El Gamble. A funny story about that night. When I got up on stage that night, the band asked me "What key?". I looked at them and said "What's a key?" I think I sang "Ain't That Loving You Baby". Later, as I was about to leave I heard them call out the winner...number 6. That was my number. So El Gamble got off to a good start. EIN: As a teenager what were your biggest musical influences? EG: Growing up, the biggest musical influence on me was Roy Orbision. I love his sound. EIN: A tremendous, soaring voice. EG: Absolutely. But I then became hooked on Elvis after watching him in the movies. So it was Elvis, Roy, Ricky Nelson. I just liked that era. EIN: Have you had any vocal training? EG: Yes, for about three minutes (laughs). No I haven't. I did go in once to have a singing lesson...this is a really good story. I walked in and the teacher starts banging on the piano and says "Sing", and I go "ahh". He does it again and I go "ahh" again. Then he closes the piano, comes over and says to me, "Son what do you now?" "I'm in my first year as an apprentice fitter and turner." He says "Son, it's a great trade, off you go." He shut the door and I bought a newspaper and boarded a train. I remember that all the way from the city to Box Hill I was crying because I thought I can't be that bad as a singer. At the time I was a drummer but I wanted to be a singer. I was just lucky the way things turned out. EIN: You never saw the singing teacher again? EG: Funny you should ask that. It would have been about 1983 or 1984. I was in a band called Fat Chance. We played at an ESSO Petroleum function. At the gig was this guy, red face and grey hair, and I said "I know him". And for the life of me I couldn't remember who he was and then it clicked, it was the singing teacher I'd gone to. After the show he came up to me and said, "It's so refreshing to hear someone you can understand". And I said "You probably don't remember me, but you told me to buzz off". He goes, "Well some miss the net." I'll never forget that but no I've never had any training. But oh did that one nail me. EIN: Let's back track. The young El Gamble and music. How did you get started in the business? EG: Would you believe I actually started as a drummer. I did this for about 16 years and I was in a band named Rainbow. We had a singer who was, how shall I put it, well he was getting a little drunk every night. Then he didn't turn up to a gig twice. At that time I used to sing seven or eight Elvis songs during the gigs and when we had this problem with the lead singer everyone decided I should replace him. I remember it well, going to rehearsal on a Tuesday night over in Glen Iris and the band members were all there and as I walked in they said, "El, meet our new drummer". I thought hello, this is strange, what have I done? And they said "It's not you, it's Paul who was the problem. Don't worry, you're our new lead singer now". And I thought, mate all I know is seven songs, and they said "we're sure you'll learn a few more". And with that I was handed this list. I must have been rough as guts when I first started, and very nervous. But it just caught on from then. And here I am many, many years later. EIN: How successful was Rainbow? EG: Well I call it big in the small time. It was a show band so we got a lot of floor shows doing corporate work. That was in Victoria. We did both city and country shows and the odd gig outside Victoria. EIN: The bands you were in were essentially show bands rather than rock 'n' roll bands. Why? EG: Man, it was out of necessity not choice. We needed the work. Where we were performing they wanted the show bands, the floor shows, so we delivered. It was Phil Gilotta who got me into it all. You'll probably know him as the front man for The Blue Echoes. They had a big hit with Going To A Party. Phil had just started up his own talent agency, Westside Talent Agency, and Ramrod and Rainbow were booked through him. Of course all the bands could play rock and roll but that's not what the patrons wanted at the time. EIN: As a show band comedy must have been part of your act? EG: Sure was. I did most of it in the band. I was able to imitate other people's voices and I would do a song like House of the Rising Sun but use say Humphrey Bogart's voice. If you can imagine Bogey doing this you'll get an idea of how funny people found it. And at other times my comedy wasn't deliberate. I remember one night I'd forgotten to do up my fly and I could see the folks at the front laughing. At the time I was singing a serious song and I couldn't work out why they found it funny. To make things worse when I turned around my shirt ripped. A great night, that one. EIN: El, your singing voice is uncannily similar to Elvis'. Is that deliberate on your part? EIN: The reason I raise this is that listening to your Variety Show album you are also able to replicate the voices of other stars including Neil Diamond and Tom Jones. EG: The easiest of all for me is Elvis. With Tom Jones I can do it. I can do a half hour tribute, but doing him hurts my throat. EIN: But how do you achieve that vocal similarity to so many singers? EG: Well you first of all listen a lot and then try your luck at it. I don't know. I've never really said to myself I'm going to sit down and really work on Elvis Presley. The only time I've ever had to fdo that was when we were doing Elvis on tour and we got a lot of videos and I had to sit down to work on his actions. That was back when I was 31 or so. What I'm trying to say is that from the beginning I never really set out to sound like Elvis, it just happened that I did. Even when my then manager, Phil Gilotta, rang me and said we're going to do an Elvis show I said you're crazy. I said people go to the movies and watch Elvis. And he said, "Mate, he'll never come out to Australia so we're going to do an Elvis show". We rehearsed it for about 3 months before we actually did it. We had Topez, a four girl group, four guys, The Woodsmen, and we had a five piece skeleton band and a three piece brass section for the Las Vegas segment. It was something that hadn't really been done before and it worked. It just cleaned up. The money was great, $700.00 a show. It may sound like peanuts now but back then that was really good money. My eyes literally lit up but despite this I actually said no when Phil pitched it to me. Then a few weeks later he knocked on my door at 11 o'clock at night. He said "Hi, I was just going past, could I have a cup of coffee with you?" Now I knew Phil and I knew when he starts something he wouldn't quit. So anyway we talked about his idea and he said, "All right we'll raise your payment to $900.00 or $1,000.00 a show. I said, and I was adamant about it, "You'll never get the gigs". But I was wrong! I was very wrong. Out of The Elvis show I got a new car, I got a deposit on a house and that was great. EIN: But your vocal similarity to Elvis is universally recognised. EG: You know it's funny. I sing songs that Elvis didn't sing, like Kenny Rogers' She Believes In Me and Bette Midler's Wind Beneath My Wings. And when they hear me they say when did Elvis record that? I don't hear that, I personally don't think I'm that close, but others do hear it. EIN: How tough was it in the early days trying to make a living and become known? EIN: Those early days must have been wild though? EG: Man, you're not wrong. Like any band who achieved some success there there was plenty to tempt you, plenty of chances for excess. EG: You're not wrong. Girls were available by the bucket loads. EG: Yeah, both were around. I tried dope once and was as sick as a dog. I'm sure it had been mixed with something. Anyway that was my one and only time. I always loved my brandy though. At one time my partner said it was either her or the brandy. Stupidly I chose the brandy but within three weeks I went crawling back to her with my tail between my legs. EIN: Over the years you have won 5 "E" awards. EG: Yes I received these in 1977 and 1978 in NSW, Victoria, Queensland, Tasmania and South Australia. Many people won't know but back then they were called Elvis awards but now they are just called "E" awards. EIN: You've played with some of the best Australia has had to offer including Australia's King of Rock 'n' Roll, Johnny O'Keefe. Tell us about that experience? EG: (laughs) Yes that was in 1971. I played with the great Johnny O'Keefe, I had only been with him for 3 weeks when he gave me the boot. I was a back up singer and (laughs again) we were working at Shepparton and after the show he called me in. I said "yeah", he said, "You're a good kid but you sing too loud. You're only a backing singer". And I said "Oh I thought I was controlled by the microphone and he goes Listen Mate", he pulled out $100.00, "Here you go, catch a bus or a train, I don't care. Go back to Melbourne". EIN: You can laugh about it now. EG: Yes, but believe me back then I was shattered. But that was my three weeks with the King. EIN: Other Aussie rockers like Col Joye and the Joy Boys? EG: I was on the same bill as Col. It would have been around 1977 or 1978. But I've worked with many others like Colin Cook, Johnny Devlin, Digger Revell and Matt Flinders. Matt had a big hit with a song I personally didn't like, Picking Up Pebbles, but he scored real big with it so it was great for him. Working with those guys was a great experience. Digger Revell was an interesting guy. He liked his drink and often after shows he didn't want a lift home. Instead he'd walk and sometimes sleep under a tree and the stars. EIN: I understand you also worked with Billy Thorpe? EG: (laughs) Well sort of. I was booked to support Billy. He was to headline until 10.30 or 11pm and I was to finish off into the early hours. I didn't want to do the show as Billy's fans were not the type of crowd I usually played to. As it turned out he came on and after 10 minutes he blew every fuse in the house. Well they fixed that and he came back. He was so loud that within another short time he'd blown all the fuses again. I'm thinking to myself, I can't follow this. Well they fixed the fuses again and Billy came back for a third time. And man did he do it big when he did...this time he blew the whole building! Billy's response was "F...k this! I'm going home", and off he went. Well the manager came up to me and said "You don't have to follow him. There's no power in the whole building and we've got to get an electrician in to fix it all up." So that was the night I almost followed Billy Thorpe. EIN: So who else have you worked with? EG: I've worked with Kamahl. He was quite a gentleman. He shocked me when he swore (laughs) but he was a gentleman! I also worked with Australia's King of Pop, Normie Rowe. I called him Norman. I worked with John Farnham. In fact we virtually started together. A funny story about John. At a place called Mitchum Rendezvous he used to be with Strings Unlimited and he left the band. At the time I used to sing up there with a house band. They didn't really have a name but people referred to them as the Mitchum Boys. They had stand-in's every night, different guys. And Johnny used to come up, he was a little round chubby faced kid and he'd say "Can I sing a song, can I sing a song, I'll sing Unchained Melody". So he'd get up and sing Unchained Melody but he'd sing it h-de-li, i hi-lo". My God! Then one day we were in the kitchen of the restaurant that doubled as our dressing room and Johnny came in. He goes "G'day guys, g'day guys" and I thought "Oh no". And one of the guitarists said "Oh not him again. What's he doing now". But he says "That's all right I don't want to sing tonight I've got a contract, I've got a recording contract". I said "Oh yeah, you've got a recording contract. Who with?" And he tells me it's with the Fable label or something like that. I said "That's good, what are you going to sing". I mean back then everything was 'I'm going to shoot you right down, boom, boom, boom', you know that sort of thing. But Johnny says he's got a song called Sadie. "I said Sadie, how does that go?" and he starts singing "Sadie the Cleaning Lady". And we all looked at each other and thought good luck with that one kid. Yeah right. And of course the rest is history. And you know until about two years ago I still heard from him. He is a top guy. I swear to God, what you see with John is what you get. You know people think he bungs the good guy thing on but no he doesn't. 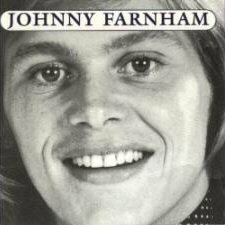 That's John Farnham, and I have the highest regard for him. EG: That was a funny one. It happened in the early 70s, maybe mid 70s and was another example of me making the not-right decisions. Kylie Minogue was, in fact she still is managed by Terry Blamey. Terry said to me I look after a girl called Kylie Minogue. Have you heard of her?" I said "Yeah, I've seen her on Neighbours". He said "I'd like to manage you as well". He had an agency called Page Agency. "He said "Why don't you two due to duo thing?." So I worked with Kylie at a shopping centre, Westfield, and gee, it was..., anyway. I mean then she was only a kid when I worked with her, probably only 14 or 15, and she wasn't that good...then. She was just starting out, you know getting one or two lines on a show. And mate, she was tiny...tiny. Anyway Terry had said he'd be taking Kylie overseas one day and said "I'll take you too". And I thought, "Yeah right mate". So I said, "Yeah, thanks mate, thanks". I mean I think Kylie's great now, she's at the top of her tree, but back then she just wasn't that good. Kylie's been great for Australia. Hats off to her, she's now a superstar. They don't get much bigger than her today. EG: You know I was almost a support act for Tom Jones in the 1960s when he was appearing at the Top Hat nightclub in melbourne. I stuffed it all up by going and getting laryngitis. EIN: Let's get back to El Gamble. EIN: After 286 very successful Elvis shows you gave it up. In the intervening 28 years what have been the musical highlights for you? EG: I reckon the biggest buzz I got was working in Queensland with a band called the Cadillacs (not to be confused with the Victorian band with the same name). Most of our work wasn't rock 'n' roll but restaurant work. That was eight years of great times. If I could get that band down here and work as we did in Queensland it would be terrific. Everything was full house up there and they were a great rock 'n' roll band. Absolutely great. Elvis stuff, they play to a 't', with my flavour in it if you know what I mean. We recorded in Queensland for the Big Studio label and we sold buckets full. Our album was called The Cadillacs Live at Beenleigh Tavern. It got as high as #16 on the local album chart. In 1999 I started doing the show, Fifties - Sixties Revival, first with Tony Dee and then Marcia Rae. 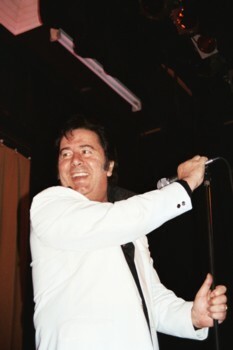 It lasted until 2003, and I then teamed up with Marcia Rae We did the shows for almost seven years, until early 2006 when I decided to return to the Elvis scene. EIN: El, you’ve recorded several albums in the past 12 months and also had considerable exposure on Elvii radio. EG: Lady Luck and Elvii Radio has been terrific for me. I've been voted the most requested artist quite a few times and that was a shock. When Ian first found the site and said he was going to submit eight of my songs I told him he was dreaming, that they wouldn't play any songs by an Australian. But they bit and that was it. I have received so much exposure that this is how my invitation to go to Memphis came about. EIN: Please tell us about that. EG: I don't know much about it at present. I wasn't there when my wife, Cheryl, took a call from the US asking if I'd be interested in coming to Graceland to sing during Elvis Week on the 30th anniversary. My wife thought it was a joke and said, "Who is this?" I can't say who it was calling, but after he convinced her he was the real deal she of course said yes, I'd love to go to Graceland. We're now just waiting on firm details to come through. They're negotiating how much work there is, what I need to do and that sort of thing. So if you think I'm nervous now, man, just wait until next year! EIN: What are you hoping will come of your return to the Elvis scene? EG: Look I've had a good life in the music scene. I'm a fitter and turner by trade but I haven't done that since 1969. When I went into music I only starved for the first 10 years (laughs). I met my wife Cheryl in 1977, got married in 1980...what was the question? Seriously, 8 weeks ago I said to Ian I didn't want to do this. I was concerned I was too old and immobile to compete with the young artists, and that few Elvis fans would remember me. And to get away with having to go on stage with these crutches, mate I didn't think I could do it. I was still concerned I couldn't do the shows I used to do. And I said to Ian, "Man, I don't want to do it." But he put a different angle on it. He said "So we'll sell it the way you are now". You'll be right and when fans hear you, they'll be won over and word will get around. Your voice will get them in." So to be honest, at that time I wasn't thinking I'd perform anymore. I was thinking of retirement. But Ian wanted me to record, he wanted me to perform, and I didn't think anything would come of it. But here I am. EIN: Five albums recorded and released in the past year suggests you must be doing something right. EG: Yeah. And I have to say, my latest album, Echoes of the King, I love it more than the others because there's more variety on it. The others are good and will appeal to those liking rock or ballads, but the latest one I'm real proud of. It has songs on it that other tribute artists don't do. I listen to a lot of albums by other tribute artists and there's always Suspicious Minds, Blue Suede Shoes, Hound Dog, you know what I mean? So I wanted to make sure I included some songs that were fresh, songs people hadn't heard for a while. I didn't want to do all of those songs, I wanted to do something different. And I think we achieved that with the Echoes album. There are three songs on the album I've recorded before: His Latest Flame, A Fool Such As I and You Gave Me A Mountain. But they are the only repeats out of 20 songs on the album. In recording the album I thought let's pace it from the earlier years to the later years. When thinking about how I'd do the concert tonight I also used that idea. 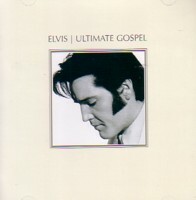 And although I'm not a real gospel singer, I've also recorded an Elvis gospel album. I don't think this one will have widespread appeal but I'll have a go at anything. EIN: How long did it take you to record Echoes of the King? EG: Honestly...it only took me about 5 hours. EIN: Five hours to record 20 tracks? EG: That's a long time. The first album which originally had 22 tracks, we had to delete two them because I didn't feel they were good enough, it took about an hour and twenty minutes in the studio. If I muck it up and have to repeat it more than once or twice it's out the window until I learn it properly. You're going to be surprised or not believe me, one of the two, but every album I've done has been about 98% first takes. I get in and I want to finish. The studio people hate me and they happen to be my sons. John does the musical backing mixing and mastering for me, Peter does the sound and vocals and Andrew adds guitar. It's a real family thing. I'm also lucky in that the Events of Events studio is in the back of my house. We record at night as I hate recording through the day. We'll often start around 11pm and finish around 4 or 5am in the morning. EIN: On your latest album you have a great balance between rock, ballads and gospel songs. What are your personal highlights from the album? EG: I was happy the way If I Can Dream came out. Another favourite, and one I really like singing, is You Gave Me A Mountain. A lot of people who have bought the album tell me they like Way Down. What were your favourite tracks? EIN: The two standout tracks for EIN were your powerful version of I Believe and the classic rockier, Johnny B. Goode. 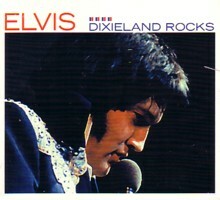 EG: Excellent, as I didn't want to say I Believe as it's not a really well known Elvis song. EIN: But you didn't do I Believe in the Elvis vein, yours was more like the Robson & Jerome single which sold 2.5 million copies in the UK in the early 90s. EG: Really. I wasn't aware of their version. But I just love that song. EIN: Apart from your recent five albums have you recorded any other solo albums?EG: No. All my other albums were as part of the Cadillacs. I did do a rehearsal album back in 1977 or 78 when we were doing the Elvis show. We had it on cassette and we put it on CD. It's great to listen to how we sounded back then and being a rehearsal tape we were laughing and carrying on a lot. We never released it officially but sometimes I just put it on and we laugh our heads off. It's really a novelty album. EIN: When you started out with your Elvis show it was something new and innovative. 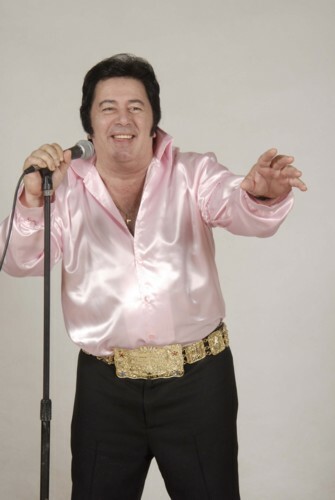 Today Australia has several Elvis tribute artists in every state. Have you seen any of them? EG: Yeah I've seen a few. I remember working at the Kingston Hall one time. Dean Vegas, who's a very good looking guy for the role, was headlining there with his Elvis show and I was in a duo at the time. People sort of knew me with Elvis though. Dean got on the phone to Ian and asked that I not sing any Elvis songs before he did. And that was fair enough, it was his show. However one night during his show I was there and Dean came up to me and said, "Why don't you sing me an Elvis song". So I got up and did Burning Love and You Gave Me A Mountain. The crowd was very favourable to me. Dean came out while I was doing You Gave Me A Mountain. He (laughs) had changed into a pair of jeans and a torn t-shirt and was holding a UDL can, and he started singing out of tune into my ear. It was very funny and the crowd loved it. He then said, "You can stop the Elvis stuff now". I saw Eddie Youngblood in Queensland. He was very good. I always thought Eddie was really good with the rockabilly Elvis. I know he did the jumpsuit bit but I always felt he was great with the earlier songs. Mark Andrew is also very good. A problem I have with many of the artists is that they either look and move right but can't sing, or they can sing but look and move like rhinoceroses, if you know what I mean. EIN: Have you ever seen Deke Rivers? EG: I've seen him on video and mate, he's the best I've seen. He's got the looks, he's got the sound, he's got the moves. And that is all you can ask for. I'm surprised he's never become a star, he really had the world at his feet. EIN: You're still based in Victoria? EG: Yes, my family's there. I love to spend time with my family now. When I was younger, and touring with the Cadillacs, I missed out on a lot as the kids were growing. I regret that. EIN: How did you hook up with your new manager, Ian Coombs and his Event of Events organisation? EG: I was doing the Beaumaris RSL Club and Ian was there with his lovely wife Debbie. He came up to me after the show and asked if I had a manager. I said I didn't. He said he had a promotions company and would like to promote me. I thought, yeah, right. Anyway he went out and bought me all of my equipment, drove me from gig to gig, and it was all done a handshake. What you get with Ian is a real friendship! 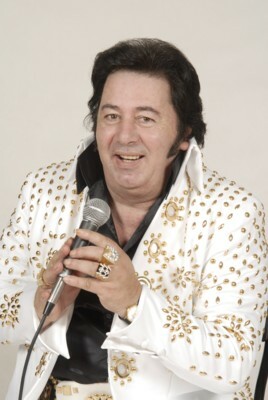 EIN: Looking back at your long career has your vocal similarity to Elvis been a help or a hindrance? EG: Both! It's opened a lot of doors but at times I've been called an imposter and people have said that I mime to Elvis records. While sometimes I can see it is flattering in a sense it also piosses me off on other occasions as my natural vocal ability is not being recognised. EIN: After such a long and successful career do you have any regrets? EG: Yeah, I had it wrong back in the early days. Like most Elvis tribute artists I tried to have it all down pat, the voice, the moves, the gestures. I wish I'd done more as I do today. 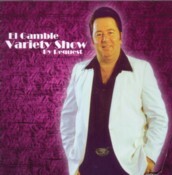 I'm more relaxed in my show and I put more of "El Gamble" into the performance. It's now more up close and intimate. Financially, giving the Elvis thing up when I did cost me a lot of money and I probably would have been in clover now had I continued doing it. But as I said before I needed to move on at that time so you just have to take life as it comes. You know quite often in life we keep the sad and bad memories and throw out the good ones. That's a big mistake. When I look back there were some very tough times. But I was really lucky. Cheryl got us through it both financially and emotionally. She is an exceptional lady. EIN: What's next for El Gamble? EG: It all hinges on tonight. 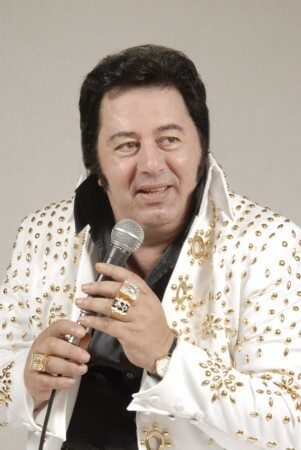 They've already booked me for the Parkes Elvis Festival* in January. I'll go on as long as they want to book me and I think I have it in me. At this stage I'm thinking I'll see out our existing bookings until the end of 2007, but if I get to the stage where I think I can improve this, there's sunlight, then I may record another album and keep on going. It's hard to say particularly with my physical condition as it is. I am determined to beat my affliction but it will be a hard road, but I'll do it. And hopefully one day I'll be able to walk back onto a stage without my crutches. EIN: You receive a lot of positive feedback after your performances. How do react to it? EG: Yeah, a lot of people come up to me after the show and say well done. But to be honest, while it's nice to hear, I judge how I went, myself. I'm my own harshest critic. I've had occasions where the audience was happy but I wasn't. EIN: Based on your last five albums you won't have any trouble in recording a sixth! EG: That is a compliment. Thank you. And like my wife says, "You've got nothing to worry about if you don't worry". EIN: El, it's been great talking to you tonight. All the best for the future both musically and personally. EG: It's been my pleasure. Thank you for coming to talk to me. I really appreciate it. EIN Note: Following this interview El Gamble conquered his doubts, mesmerising his audience with an exhausting performance which saw them deliver a series of standing ovations.